Pour cooled pudding into the pie crust. Beat egg whites until frothy. Add sugar gradually and continue beating until stiff peaks form. Add vanilla. Pile on pie and bake at 325° for 15 to 20 minutes. Not too many people take the time to make a really great old fashion pie these days. It's so easy to open a box of pudding. This is worth the time! 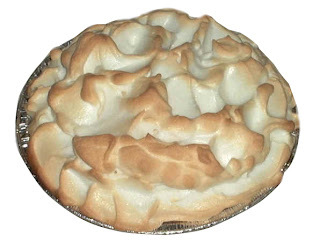 I can tell you from my own experience growing up and even today...once you've tried this recipe you will not want to order Banana Cream pie in a restaurant ever again.